The digital market has a brand new audience and many grandparents are pretty upset about it. Infants are expected be the next big target for iPads. 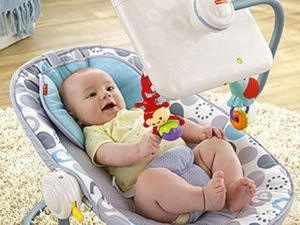 Fisher-Price has just introduced the “Newborn-to-Toddler Apptivity Seat for iPad®.” It will retail for $80. Please don’t throw a hissy fit. No one is suggesting that you give a baby an iPad instead of quality time with the family. All this product is supposed to be is a sensible alternative to a TV set where you don’t necessarily control the content. You can’t negate the fact that children today are growing up in a digital world. A Fisher-Price spokeswoman told me an iPad should be no different than a toy. Everything in moderation. This entry was posted in digital, senior lifestyle, tech and tagged Fisher-Price, iPad by loiswhitman. Bookmark the permalink. Maybe my grandson can show me the secrets of this thing!